This Tiny Demon doll was supposed to be the last doll for 2015th, but the year appeared to be too short for finishing all my projects, so she has become the first doll from 2016th. 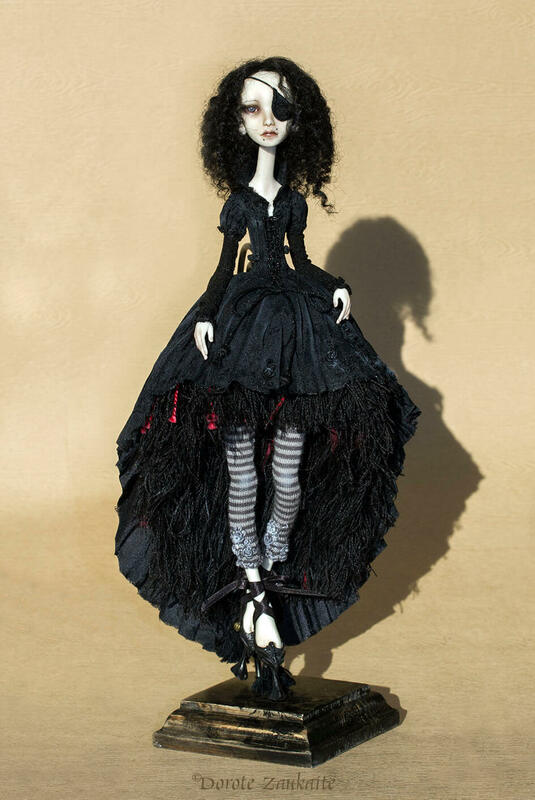 I love dolls wearing black, there is something magical about that color, how ever I think this is the last one that I am making in black at this size. My eyes are failing. I can’t work on black clothes for too long. I am embroidering and sewing for few hours a day and then I have to put the dress aside, as my eyes go tired and I simply do not see what I am doing anymore. What a pitty… Well I guess this is a sign for me to move to dolls of bigger size. 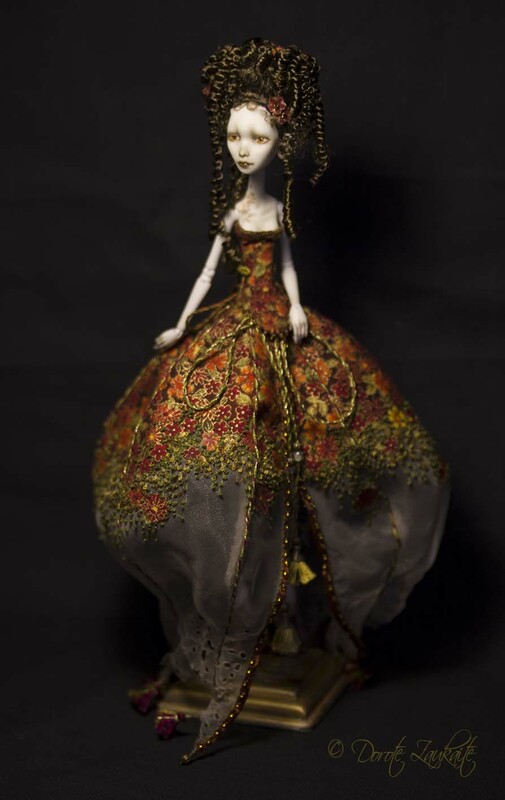 “What if I use a crackle glaze on a porcelain doll” – ordered glaze, experimented a couple of times mixing different colors and firing until I have found the shade and texture that I needed for this doll. It came out beautifully. yay! “What if I string the doll with help of a flexible wire” – bought flexible wire of different thickness, tried out several ways of stringing, spent some days on rethinking the scheme – it didn’t work, and I had to come back to a classical way. pfff… not all experiments end up successfully, but it is still a useful experience. That feeling of harmony with the world and oneself, that feeling of being able to accept and to give, that feeling of fulfilment…simply blooming. 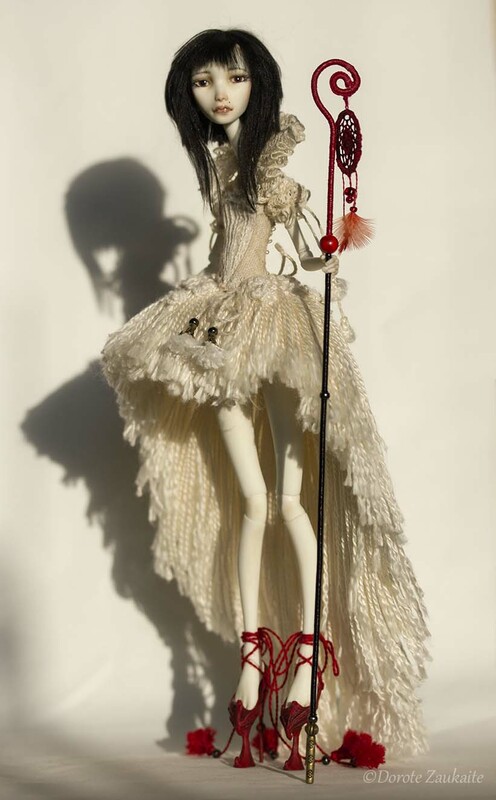 The doll is stringed with metal springs. And here one more beautiful journey has come to the end. It was absolutely fantastic to meet Brenda – a beautiful lady who loves travels, dolls and cats. I loved creating this personal demon very much, and I must admit that I have surprised myself creating a cat chair for this tiny dollie. 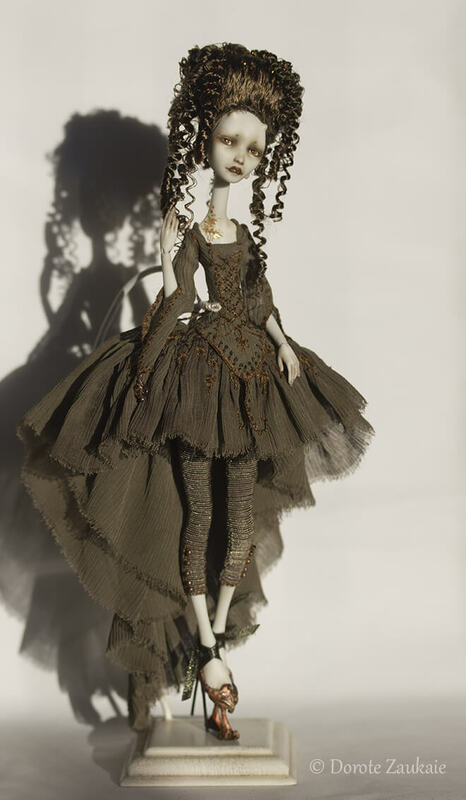 I am very happy to know that the owner of the doll liked it a lot, and especially pleased that the doll has come right for her birthday (even when I didn’t know the date). Sparrows – the little gray/brown birds – they are everywhere. Picking up seeds, making noise in the twisted branches of my garden hedge, fighting over a tastier crumb or simply sitting on a treetop and enjoying the sun. No one pays attention to them, no one admires them for their voice of beauty, but they seem to not care of it at all. They live their happy sparrow life, and they have no idea that the world is as it is because there are sparrows. “Little Sparrow” is one more artistic interpretation of Tiny Tender Demon. 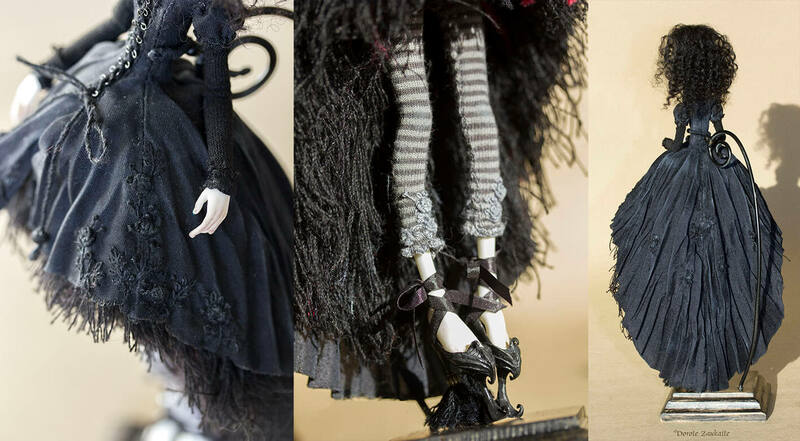 The doll is around 25 cm tall. Her layered dress was sewn from fine transparent fabrics, embroidered with “muline” threads and aged in my original technique. It was really tricky to make her corset with long sleeves but I liked so much how it has come out, that I am definitely making more. 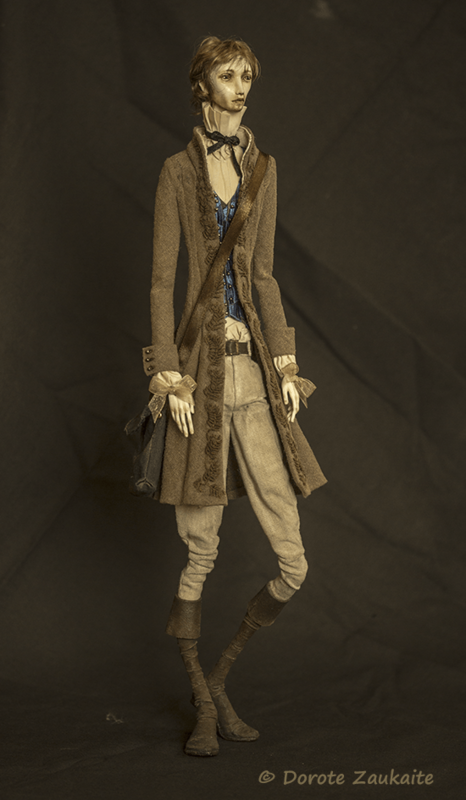 I have been dressing up a doll and thought I will make a photo-tutorial along the way as a small gift for my followers. 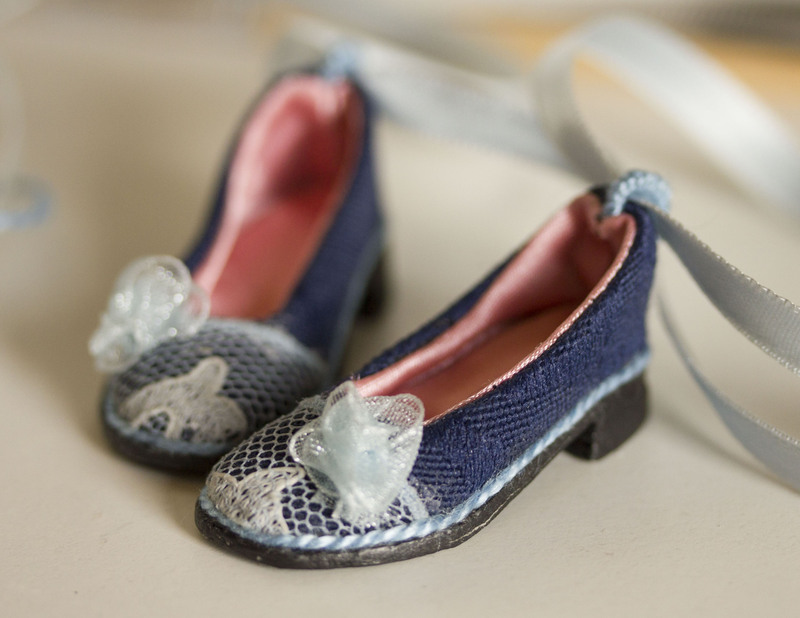 So here is how to make doll shoes. It’s been a while since my last post… I am sorry for not posting more often. But you know me, when I am not posting, I am most probably working on something. There are several projects going on in my studio, and all of them are long term projects, but hopefully I will show you some new dollies soon. 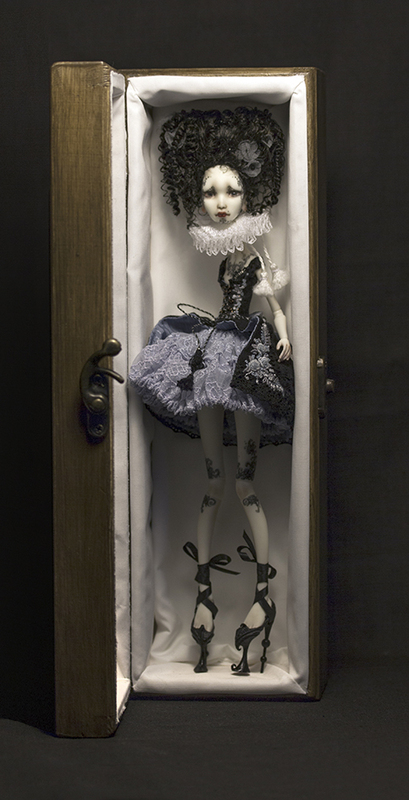 Meanwhile, I have upgraded one of my earlier dolls and decided to offer it for my dear collectors. 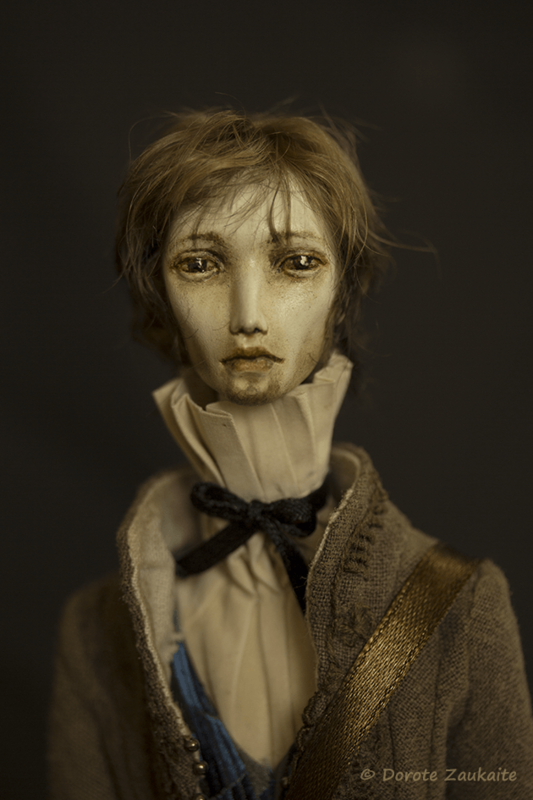 This doll is very special, because it is my first male doll. His name is Eros, and he is a traveling artist. A gentle man of a romantic nature, he is welcome in boudoirs of high born ladies and joyfully greeted by peasant girls. 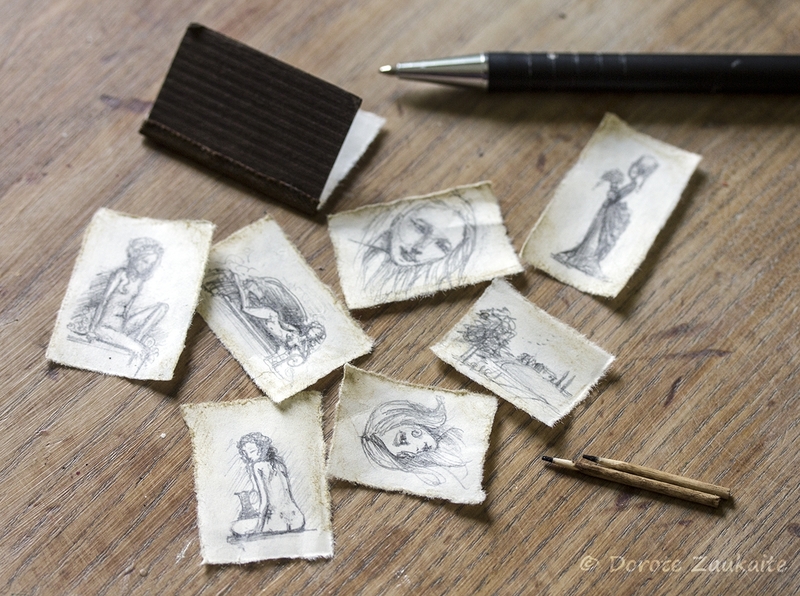 If you will take a look at his sketches, you will see how tenderly he reflects his admiration for his muses. They say that Sirens have magic voices and are attracting sailors with their songs and a shine of their jewels to the rocky shores. The ships are breaking against the rocks and the sailors find their death on the bottom of the sea. I say, those sailors are just too greedy. It’s not enough for them to listen to those beautiful voices and admire their beauty from a distance. They are rushing to the shore expecting to catch themselves a rich bride to trap her and to hide her from the rest of the world… silly men – at the end they are getting what they deserve. 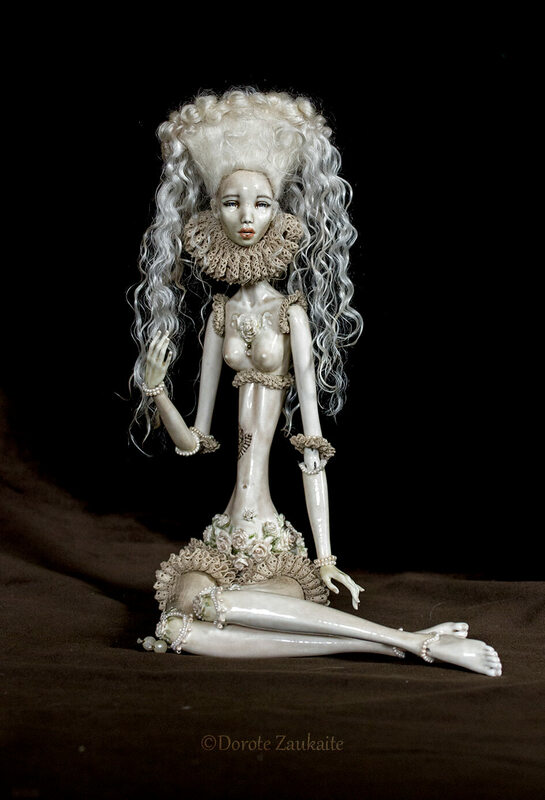 The upper part of the dolls is made from bone China (porcelain), and the lower part is sculpted formacie dry clay on wire armature. The costumes are decorated with hand embroidery, glass and semiprecious stone beads. The jewelery is from gold, silver, diamonds and precious stones. Their crowns can be wron as rings and necklaces are also fitting human.